Our initial service call rate is $59.95 (this includes trip charge and diagnostics). 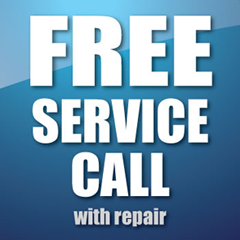 This fee will be waived if you repair with our service. We believe in transparent, fair pricing, so all of our technicians carry a pricing guide which will be used to determine repair costs. You’ll get a detailed estimate from our technician before they proceed with any repairs. Never any surprises or hidden costs. There is no extra fee for weekend / evening service calls. Parking: Please let us know if our technician needs to make any special parking arrangements when driving to your location. Parking fees will be covered by us unless they exceed $10. Commercial Service: Our service fee for commercial service is $89.95. Emergency & Holiday Service: We can accommodate your holiday and emergency service requests — our fee for these requests is $50 on top of our standard initial service fee. Emergency / Holiday Service is considered any service request outside of our standard operating hours: Monday through Saturday, 7:30am to 5pm or on federally-recognized US holidays. We will always inform you in advance if any of these additional fees are to apply to your service request. For the vast majority of our service requests, the service fee is simply $59.95. If you need any clarification, please call us at (214) 974-0630 or drop us a line via our contact form.